For a whole week, the idyllic town of Vietri-sul-Mare on the Amalfi Coast in Italy became the World capital of Social Signal Processing. 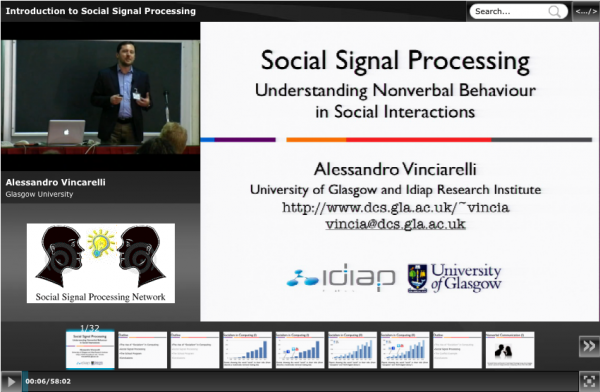 Dr. Alessandro Vinciarelli gave an introductory lecture about Understanding Nonverbal Behaviour in Social Interactions. Alessandro Vinciarelli is co-founder of Klewel and he is principal instigator of SSPnet European Network of Excellence. Social intelligence is the facet of our cognitive abilities that guides us through the complex web of our everyday interactions. At its heart, social intelligence aims at an adaptive use, accurate interpretation and appropriate display of social signals. These are discrete units of behavior, vocalization, chemicals, or morphological structure that are displayed to convey adaptive traits or states that are not directly perceivable from the outside. A peculiarity of social signals is that they can take the form of complex constellations of nonverbal behavioral cues (facial expressions, prosody, gestures, postures, etc.) that accompany any human-human (and human-machine) interaction. For example, laughter is a complex signal that involves changes in the facial expression, vocalization, body posture and movements of the signaller. 1) Is it possible to detect automatically nonverbal behavioral cues in data captured with sensors like microphones and cameras? 2) Is it possible to automatically infer attitudes from nonverbal behavioral cues detected through sensors like microphones and cameras? 3) Is it possible to synthesize nonverbal behavioral cues conveying desired relational attitudes for embodiment of social behaviors in artificial agents, robots or other manufacts? Under the direction of Alessandro Vincarelli from the university of Glasgow and the IDIAP research institute, The SSPNET Summer School organized a set of lectures around these core questions, trying to resume the state of the art of this fascinating research field. If you are part of a European Research project and need to disseminate your results, do not hesitate to contact us. Klewel proposes special packages to webcast workshops, meetings in the context of European research projects. Thanks to Klewel and its Triskel Solution, learn more about existing subjects by browsing the video proceedings about foundational issues in Human-Robot; real-time and robust solutions for eye detection and tracking, head pose estimation and their applications to gaze estimation, attention detection and personality; the dynamics of cortical coding of this information; to understand the social aspect of human communication and its implication on statistical and probabilistic modeling.